6.77 points at 13 votes (rank 414). 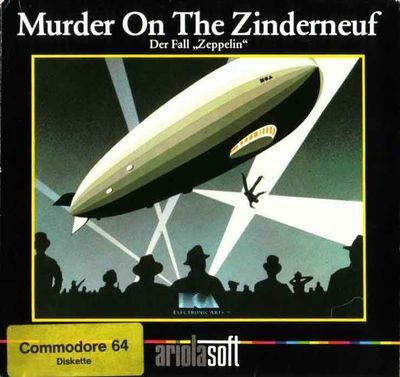 Murder on the Zinderneuf is a crime story adventure in multiple-choice style with joystick controls by Electronic Arts which was ported to the C64 in 1984. 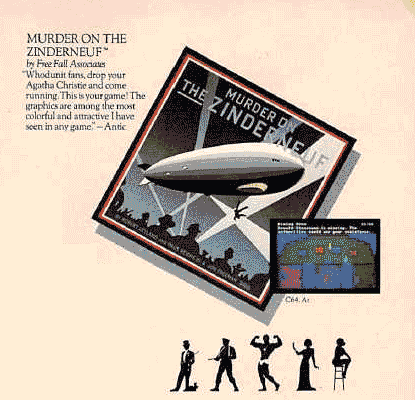 The aim of the game is to solve a murder case on board of an airship. 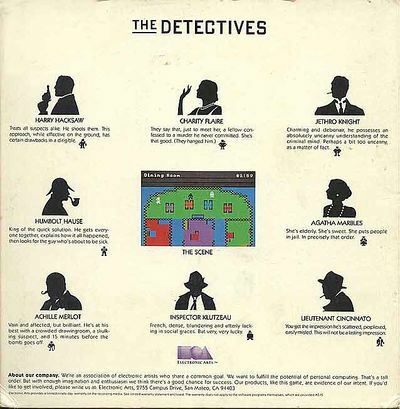 To do this, the player takes over the role of one of eight possible detectives, to question the remaining passengers and search their cabins for hints and evidence. 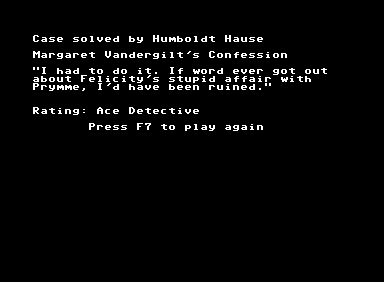 A random generator allocates the roles of the victims, murderer and possible motives and hints anew with every restart. A party can last up to 36 minutes. Will Harry Hacksaw solve the case in time, before the Zinderneuf arrives in New York? Stay tuned, we will be right back after this commercial break...! 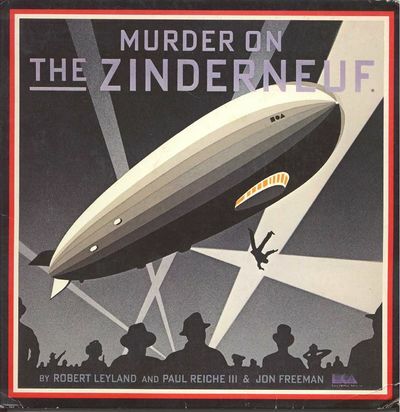 It is 1936: At a height of about 1523m above the North Atlantic flies the luxury zeppelin "Zinderneuf" from London to New York. There are twelve hourse left until the arrival, so enough time to kill. But there is someone on board who takes this too literal, as all of a sudden one of the 16 passengers falls victim to a murder and once again no one admits to having "dunnit". Therefore it seems like an unbelievable coincidence, that just one of the most well-known and most brilliant detectives of all times is on board and immediately starts to investigate the case. On the search for the deciding evidence..."Out with it or I will break your arm!!!" The player decides for one of eight possible characters, which all seem clearly to be inspired by models from the movies and criminal literature. 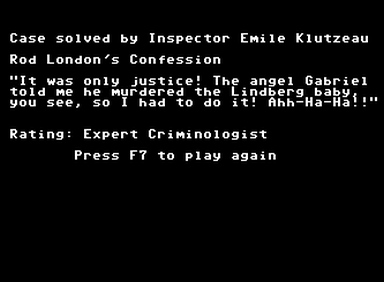 There are 12 hours game time left to catch the murderer before he runs off in New York unpunished, whereby each hour corresponds to about 3 minutes real time. An acoustic signal announces the passing of one hour game time. As a choice you have such dazzling figures as the slightly scatty inspector Emile Klutzeau from the French Sûreté, the brutal detective Harry Hacksaw - dreaded for his "pragmatic" methods - or the hoary criminal quirk Miss Agatha Marbles, and many more. Depending on what character you choose, some aspects of the game are aggravated or facilitated, e.g. the super brain Humboldt Hause is excellent in finding traces, while the female charmes of Charity Flair are often enough to get the male counterpart to give unmasking information. Furthermore, each detective has a certain repertoire of questioning methods. Depending on the chosen character, they can range from intimidating over matey to "confused" and produce different result with every person questioned. The passengers also pose a mixed group on the Zinderneuf: a mingle-mangle of odd fishes with obscure pasts and dark secrets - one even more suspect than the other. It is recommended to study the background of the passengers to see which relation they have to each other and to be better able to put the testimonies into the right context. If you succeed to collect enough information by questioning the passengers and to find enough clues while searching the cabins, you can accuse the main suspect to be the murder. However, he will only admit it, if really enough evidence has been found - you should be really really confident or you risk that the person will not speak to you again and you get also points subtracted from your score. No matter if the murderer was found or not, after the twelve hours have passed it will be revealed who the murderer was and what his motive was. To question a passenger you just bump into it with your character and a dialogue appears at the upper rim of the screen. Here you can decide to either question the person ("question"), ignore him/her ("ignore") or accuse him/her as a suspect ("accuse suspect"). If you decide for questioning you have to choose in what inflection/ mood the questioning should take place. Depending on how good the questioned responds to the chosen mood you can ask him up to three questions about his opinion/knowledge about the fellow passengers. For this you choose a person's name about which you want to get information, from the list. If the questioned person is not at all happy with your inflection of the questioning, you will only get a more or less clear request to to leave him/her alone (e.g. "Get lost!" or "Take a swim!"). It can also be that the questioned person simply has no information about the corresponding person ("You got me!" or "We are not acquainted."). It is equally fruitless to ask the suspect questions about his/her own person, this will be answered with a cynical "Read my biography" or something similar. After you have asked your three questions, the conversation is aborted. You can then only ask the person new questions after having questioned another person. By "ignore" a person is ignored until you have found a new clue (s. below). Until then you cannot speak to him/her. As already mentioned, you should only use the last point "accuse suspect", if you are absolutely sure that you are facing the murderer and you can show enough evidence. Else this will lead to the situation that the person will not talk to you for the rest of the game (and maybe conceal valuable information). Miss Marble discovers something while searching other people's drawers. It is recommended to now question persons to which you can make a connection due to the found clue. While you search a room for clues, you must not touch a passenger or else the search will start anew. 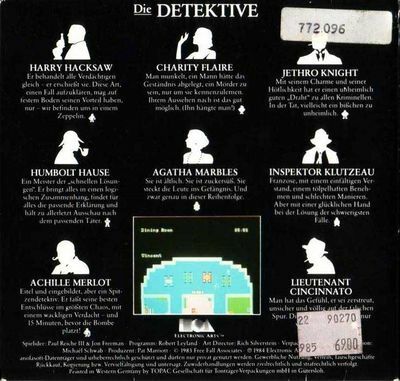 In each game there is an additional especially grave clue, the so-called motif clue, a clue, with which you can rather distinctly suggest the motiv of the murderer and maybe even the murderer himself. you will only find the "motif clue" in a room in which you have already found a "normal" clue, while there is no passenger in the room. These three preconditions aggravate the search for the "motif clue" heavily and it takes sometimes a lot of patience to find it. The game ends at the latest after the 12 hours game time (about 36 minutes real time) have passed. Until then you have to have enough evidence by questioning the passengers and finding clues, especially the "motif clue" to expose one of the fellow travellers as murderer with a reasonably safe feeling and background. This happens by choosing "accuse suspect"' when talking to the potential murderer. If you are correct and have enough evidence he will confess his deeds and name his motive. If you are wrong, you get a harsh rejection and the person will not talk to you again. Furthermore, the rank at the end will be lowered. Of course nothing keeps you from accusing further passengers, with the just mentioned consequences in case of another failure. If you do not know how to go on, you can also without further ado abort the game with the key Q . In this case or after the time has run out, the game will reveal the murderer and his/her motive. In both cases you can bring in a last action ("final verdict") before, to sort of find the murder "hit or miss". If this succeeds against everyone's expectations, you will receive at least a reasonably good ranking. Otherwise at the best a sneering comment. Sound? Which sound? Not the short tootling in the title screen or the extremely inept walking noises during the game, that sound like a catatonic xylophone player? No, there is nothing to get here. 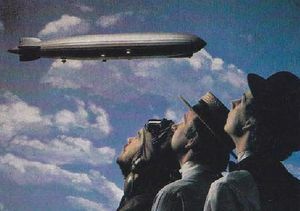 They even abstained from building in the motor sounds, which increases and decreases in volume in the Atari version, depending on how far away you are from the rear of the zeppelin...what a pity! 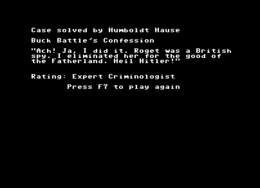 The given rank at the end of the game is oriented on the time needed and the number of found clues. Wrong incriminations reduce the rank significantly. Also there is a big minus when the time has run out, although you still have found the murderer through the "final verdict". Treats all suspects alike: he shoots them! This approach, while effective on the ground, has certain drawbacks in a dirigible! King of the quick solution. He gets everyone together, explains how it all happened, then looks for the guy who's about to be sick. French, dense, blundering and utterly lacking social graces. But very, very lucky. She is elderly. She is sweet. She puts people into jail. In precisely that order. You get the impression that he is scattered, perplexed and easily misled. This will not be a lasting impression. Charming and debonair, he possesses an absolutely uncanny understanding of the criminal mind. Perhaps a bit too uncanny, as a matter of fact. They say that, just to meet her, a fellow confessed to a murder he never committed. She is that good. (They hanged him). Vain and affected, but brilliant. He is at his best with a crowded drawing-room, a skulking suspect and 15 minutes before the bomb goes off. Was discovered in the Slums of Soho by a talent seeker, who she later married. She was a big Hollywood Star in the 20s and probably also one of the secret "women in black", who lay down flowers at Rudolpho Valentino's grave. After her husband had fallen in the First World War and her career came more and more to end in the last years due to a lack of demand, she decided to marry Buck Battle, the main actor of the new Tarzan movie, to get at least a role as "Jane". Actually he is just a blonde boy from the country, until he discovered swimming. A comet-like rise followed, not last fostered by his powerful-"American" appearance. He won the gold medal in 300m freestyle at the Olypmics in Munich 1936, which quasi made him a national hero. Shortly afterwards, he married Veronica Marlowe, despite the age difference of about 20 years and played together with her the main role in "Tarzan's Jungle Lust". She runs a known gossip column with the title "Listen to my words! ", with which she already managed to destroy several careers and to agonize many people. Despite her age of 44 years she still looks staggeringly great. She is divorced once, and widowed twice, wears glasses, has long brown hair and smokes long ladies cigarettes. She is the mother of Felicity Sucrose and supports with her money the unfortunate artist Vincent van Wente. Claims in turns to be a pupil of Escher or some other Italian futuristic. His ado in the French art scene was not crowned with much success until he got to know Margaret Vandergilt when she was on holiday in Paris. Whether she was stoked by his arguable talent or his youthful appearance, who knows? He has brown hair, smokes the same cigarette brand as Margaret Vandergilt (and uses also a cigarette holder). There is not much known about Natalja's life before she was entrusted to Reverend Jeremiah Folmuth's care. According to his information, her parents were Czech and were killed in the "Great War". But a rumour stays around persistently, that she had to flee from the revolution in the tsarist Russia. She, 19 years old, slim and black-haired, dedicates her life to the ballet and is well on the way to becoming a prima ballerina. Folmuth started his career with fighting several voodoo cults in the Bayous of Louisiana and was later famous as radio preacher. He fought passionately for the prohibition and started an unsuccessful campaign to ban the performance of the Jazz musician Rudy Vallée, as they were - in his words - "satanic!" and "thrilling!". Although the 42 year old red-haired man preaches of a life full of abstinence, he earned more than 100.000$ in 1935 and rumour has it that he evades taxes. She is the daughter of the famous inventor Felix Q. Winston and the fiery suffragette Desiree Hart. She inherited from her mother next to the red hair and the unshakeable self-confidence also a considerable fortune. She visited the best schools in the country and studied mysticism in tibet, climbed in the Andes and travelled the Far east. She knows how to handle expertly rifles and pistols and is the youngest woman that has flown alone over the Atlantic. She is 27 years old and has admirers in the whole world. Aldo Sandini, or "The Great Sandini", was originally a magician for the stage and ventriloquist before he got to know Aleister Crowley in 1928. He undertook with his help many spiritual travels through his earlier lives, to which also the famous magician Merlin belonged. Sandini is 40 and works - favoured by his good looks - as mental medium for rich widows who want to get in contact with their dead husbands. He has black hair and is a chain smoker. Felicity is a sugar-sweat young mite of 18 years and the model-daughter of Margaret Vandergilt and her first husband (who had fallen in the First World War). She is a well-educated blonde, who was allowed to "enjoy" the best imaginable education in the most expensive European private schools for daughters of wealthy circles. A reason for speculation, however, is the fact that she did not let any of her various admirers close to her. Rod London's parents were killed during the Boxer Rebellion when he was still a child. Although he inherited a princely estate in Northumbria, he always preferred a life full of "Action". As a classical mercenary and venturer he served during the Spanish Civil War under Franco and fought Mussolini's troups in Abyssinia and Ethiopia. He is 36 and a true roughneck of a man, has black hair and exclusively smokes English cigarettes. A former fan dancer and stripper, who has been arrested during her excessive career several times due to indecent behaviour and has taken part in at least one so-called "art-house film". Her blond hair and female curves have a magnetic effect on the world of men. She is in a relationship with the industrial magnate Oswald Stonemann, who she married at the same evening at which they got to know each other, and is a strong smoker. Grew up as the son of poor immigrants in the streets of Chicago. At the age of 25 he started his first bigger company and belonged to the beneficiaries of the prohibition times in the USA. He is owner of several steel foundries, brandy shops and even an ammunition factory. He is baldheaded, overweight, wears glasses and smokes stinking Havanna cigars. Marie Roget got to know the Hungarian aristocrat Anton Peste during a travel through Central Europe, when she was only 20 years old. But she finally married him after she made the breakthrough in the fashion world with the publishment of her own collection. She is an attractive women at the age of 36, with styled brown hair and glasses. Marie is normally of gentle and sensitive nature, but she can become a revengeful fury when facing rivals. A Hungarian nobleman, who despite his age appears "astonishingly" young and attractive. He is tall, has black hair and a peculiarly pale skin. Often, he wears old-fashioned looking dark suits. He speaks fluently English, but with a slight accent. Anton Peste is a polite and calm contemporary, who shows absolute devotion towards his wife Marie Roget. A library employee who claims to have won the flight in the Zinderneuf in a competition, of which none of the passengers has ever heard a thing. She wears glasses and has her brown hair done in a bun. Although she is sometimes dressed unfavourably, there are seldom moments in which her face exerts a certain pull. She is a calm and reclusively living person. Stems from the vicinity of Boston and holds a chair for history and theology, especially the ones of primitive, past cultures. Lately, his interest lies more and more in the druidic stone circles of England and similar prehistoric structures on the mainland of Europe. A sort of inconsiderable contemporary with glasses and brown hair, who -however- has been heard screaming terribly several times in an unknown language in the night. At first, the victim's room should be searched for clues. From them you can mostly draw conclusions about which passenger could be a closer suspect. But not all clues have something to do with the murder. The number of wrong traces is sometimes considerable. A room that has once given the result "nothing found" after the last search, will provide the same result in the future. The tone of a interrogation should be "in character" with the chosen detective. You should also take care to adapt the tone to the person questioned. Many characters react strongly to impolite manner, others actually need some callousness to be able to express themselves. Normally the passengers only stay in their own cabins, on the corridor or in the dining-hall in the front deck as well as the lounge on the afterdeck of the Zinderneuf. Passengers, which are in the rooms of other passengers are potentially suspect (unless they have a certain relation to them according to their background story). If a questioned person uses the first name of a person, if you ask for him/her, this suggests a certain closeness. This can also be suspicious. Robert Leyland, Jon Freeman and Paul Reiche III look thoughtfully onto the Zinderneuf. (Telematch/Computer Praxis 11/84, probably from the inside of the game cover. "Game critics of the Happy Computer"
Robotron2084: "A diverting and partially suprisingly funny mini criminal action adventure for in between, that - although not by graphics and sound - knows how to convince with much style and wit. It somehow reminds me of a full automatic computer game version of the board game classic "Cluedo", including certaing lengths in the course of the game. Unfortunately, some cases are at first very inscrutable, there you have lots of pain to find out the right clues between all the red herrings and wrong information. But many of them compensate at the end by an equally unexpected and logical explanation which you just did not see, as you have just overseen one "small" detail. Furthermore, the game teems with ingenious ideas and allusions to the great criminal heroes from the movies and literature - one single persiflage on the culture of the 30s and 40s and their stereotypes. Here every cliché is confirmed, from the fit of jealousy to the Nazi spy! Easily reached 7 out of 10 points." Blubarju: "If you disregard the weak graphics and the practically absence of sound FX, there is a diversified game left for in between. But not more than that. Therefore "only" 6 points from me. Colt Seavers: "Recommendable fiddling with 30s cliché character and full of allusions to bizarre personalities of that time, from the wrong Anastasia over Hedda Hopper and Sally Rand to H.P. Lovecraft everything is on board, which can be offered as material for dozens of more or less dodgy and sometimes insanely funny murderer-victim-motive combinations. You can replay the game anew correspindingly often whithout getting the same case twice - very well. The appearance and soundscape are even for skill games a but too much. Therefore only 7 points from me." 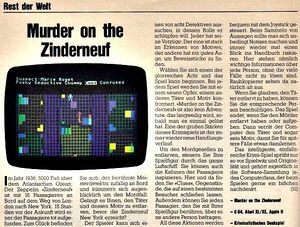 Extract from an advertisement for the first games selection by Electronic Arts for the C64 to which also Murder on the Zinderneuf belonged. This page was last modified on 21 December 2014, at 20:54.